Oliver Goldsmith (1728–1774) moved between the genres and geographies of enlightenment writing with considerable dexterity. As a consequence he has been characterized as a passive purveyor of enlightenment thought, a hack, a harried translator of the French enlightenment for an English audience, an ideological lackey, and a subtle ironist. In poetry, he is either a compliant pastoralist or an engaged social critic. Yet Goldsmith’s career is as complex and as contradictory as the enlightenment currents across which he wrote, and there is in Goldsmith’s oeuvre a set of themes—including his opposition to the new imperialism and to glibly declared principles of liberty—which this book addresses as a manifestation of his Irishness. Michael Griffin places Goldsmith in two contexts: one is the intellectual and political culture in which he worked as a professional author living in London; the other is that of his nationality and his as yet unstudied Jacobite politics. 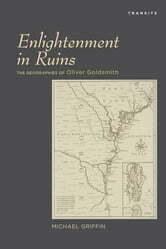 Enlightenment in Ruins thereby reveals a body of work that is compellingly marked by tensions and transits between Irishness and Englishness, between poetic and professional imperatives, and between cultural and scientific spheres.